Iris Li was born in China and began her clarinet studies at the age of 6. She was one of the leaders of the school’s marching band which was part of the military band of the People’s Liberation army of China. When Iris worked at the school’s marching band, she participated in competitions and performances more than 20 times and won the 1st prize 5 times (e.g. Forum on China-Africa Cooperation Beijing 2006, Shanghai Spring International Music Festival 2009). When she was 11, she started playing saxophone. Since Iris began her saxophone studies, she has participated in master-classes and performances with different saxophonists from different countries, including Detlef Bensmann, Shyen Lee, Sergey Kolesov, Anna Stepanova, Fernando Ramos, Joan Marti-Frasquier, Sonic.art quartett, Nobuya Sugawa and gained praise for her beautiful tone colour of playing saxophone from all master-class tutors. 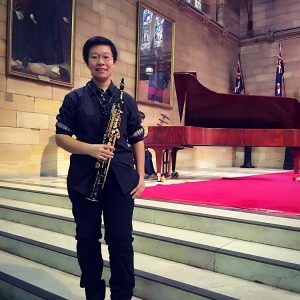 Iris moved to Australia from Beijing, China in 2014 and graduated from the University of Sydney foundation program last year and finished her first public recital at Sydney on April 2017.